Attaches to bottom of helmet between liner and shell. Difficult to fit on some helmets. Doesn’t block all noise, depending upon helmet design. Our Motorcycle Helmet Noise page has generated a stack of emails since it was first posted. These confirm our belief that helmet noise is a significant problem for motorcyclists. Unfortunately, there aren’t many things a rider can do to limit or attenuate the volume or type of helmet noise. The problem and its solution starts at the factory. The helmet’s aerodynamics; the liner design material, thickness and shape; the air vents; the visor and other features all contribute to the volume and frequency of helmet noise. Our studies indicate that the motorcycle itself can contribute to helmet noise levels, with turbulence caused by fairings or windscreens as one of the primary culprits. We reviewed the Windjammer helmet wind blocker some time ago, which fits over the bottom of a full-face motorcycle helmet and can help reduce some types of wind noise caused by turbulence under the helmet. 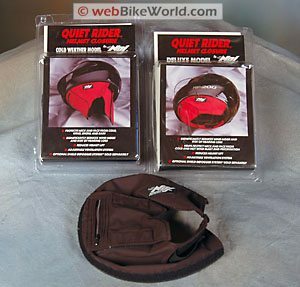 A visitor’s tip led us to the NOJ Quiet Rider (NOJ = “No Ordinary Journey”), which is similar to the Windjammer in that it fits over the bottom of the helmet and is claimed to “significantly reduce wind noise and risk of hearing loss”. The Quiet Rider is designed to slip into the space between the helmet shell and the liner. A curtain hangs down and fits around the rider’s neck, offering some protection from cold drafts during the winter. The product is available in two versions, the “Deluxe Model” and the “Cold Weather Model” with a longer neck curtain that can be tucked under the collar of some motorcycle jackets. Each is made from a windproof and (claimed) waterproof nylon fabric, backed with a soft fleece-like material. The outer fabric is treated with “Ultrex”, which is apparently a type of coating that allows moisture to escape but which prevents rain from entering. The front of the curtain is a separate piece that attaches with “hook and loop” fastener to the main body of the Quiet Rider. An 85 mm long zipper can be opened to allow some air to flow in under the curtain during hot weather. The back of the curtain includes an elastic belt with a “hook and loop” end; this allows some customization with regards to fit around the rider’s head. The edges of the Quiet Rider are backed with a flexible length of plastic, which acts as a stiffener. The product is installed by sliding this edge into the thin section between the helmet liner and the helmet shell. The installation ranges from relatively easy to very difficult, depending upon the design of the helmet. We’ve been using the Quiet Riders on the Bell Sprint helmet reviewed recently and also on an Arai Quantum II (review). We presumed that the Quiet Rider would easily slip into the Bell but would be a tight fit in the Arai, because of what appeared to be a tighter tolerance in the fit of the Arai’s liner to its shell. In fact, just the opposite is true: the Quiet Rider easily fits the Quantum II, but it’s a real struggle to get it to fit into the Bell Sprint, especially around the chin area. The instructions suggest fitting the Quiet Rider into the chin area first and then working outwards towards the back of the helmet, but we found it much easier, relatively speaking, to line it up around the helmet and work from the rear edge towards the front. This seems to make it easier to fit the edge around the curve of the chin. Installing the NOJ Quiet Rider ranges from fairly easy to very difficult, depending upon the helmet design. Once the Quiet Rider is installed, the front section must be pulled open and the helmet can fit over the rider’s head. After the helmet is secured, the front section is reattached to the “hook and loop” fastener. It takes a few seconds to work the Quiet Rider’s material down around the neck so that it’s properly fitted. ‘ve gotten into the habit of running my fingers along the bottom of the helmet to ensure that the Quiet Rider hasn’t come loose from in between the liner and the shell. Our feeling is that the Quiet Rider is designed to be a semi-permanent installation. 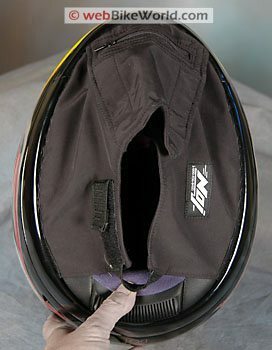 The fuzzy material around the outer edge, which is designed to add some grip to the liner to keep the product in place, seems to lose its texture rather quickly, making it easy for the Quiet Rider to come loose, especially in helmets where the fit is loose to begin with. The real question is, does it work as advertised? We ran some trials, comparing the noise levels experienced with and without the Quiet Rider, installed on the Bell Sprint and Arai Quantum II. We attempted to limit the variables, so we rode the motorcycle over the same course, trying to use the same shift points and speeds within minutes of each other on the same day. We also recorded the noise volume, using the equipment and methods described on the wBWMotorcycle Helmet Noise page. Available below are MP3 files for each helmet with and without the Quiet Rider installed. We also created a comparison sound track, using the sound experienced in the Arai Quantum II helmet before and after the Quiet Rider was installed. Our review of the Bell Sprint indicated that the helmet is one of the noisiest that we’ve experienced. Although we had some trouble determining precisely where the noise was emanating from, we theorized that the noise levels might be reduced when using a product like the Quiet Rider. The Arai Quantum II is relatively quiet, but has an annoying high-pitched whistling noise, caused by the air flowing over the top vents. The helmet also produces a low-frequency “booming” noise from underneath, which is exacerbated by turbulence spilling off certain types of windscreens. The Quiet Rider is not designed to eliminate the vent noise. In fact, we’ve found that wind-blocking products like the Quiet Rider or the Windjammer can actually increase some perceived noise levels, because they can block the loudest noises, making weaker noises more apparent. But we thought the Quiet Rider might help reduce the “booming” noise emanating from under the Arai. Our theories were proven true. The Quiet Rider did nothing to reduce the noise inside the Bell Sprint, unfortunately. In fact, we’d say that the apparent noise levels are actually higher with the Quiet Rider installed. We’re not sure why this is, but it confirms to us our original supposition that something in the design of this helmet causes it to be inherently noisy. The Quiet Rider did help to reduce the “booming” noise on the Arai; however, the overall noise levels are not reduced as much as we’d hoped. We think there is a reason for this: the Quiet Rider is not designed to fit all the way around the circumference of the helmet opening. About 15% of the area in the back of the helmet, behind the rider’s head, is left open for air to flow out as an exhaust. Unfortunately, this is one of the most critical areas for noise reduction, because the lower frequency “booming” noises are usually generated by turbulence around the bottom and back of the helmet. 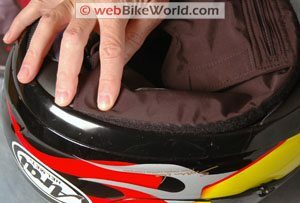 See the wBW Motorcycle Helmet Noise page for more information and recordings. We think the Quiet Rider could also benefit from a thicker interior lining, which could help absorb some of the sound. This might mean that the product would be less comfortable in warm weather, but since its primary purpose is to reduce noise, the tradeoff might be worth it. The Quiet Rider does reduce cold air drafts around the rider’s neck, especially with the cold weather model. We have mixed opinions on this product. The price is relatively high; we can’t find a website for the manufacturer, but the price seems to range around $39.95 for the Deluxe model and $59.95 for the cold weather version. We do not notice an immediate decrease in noise levels with the Quiet Rider installed, which is a disappointment. It seems to work better on some helmets than others, and can be difficult to install. It also decreases the amount of cooling airflow around the rider’s neck, which is a benefit in cool weather but a drawback during the summer. Colors: Black, Red Made In: U.S.A.
From “R.P.” (February 2012): “I’ve been using one for the last 2 years on a Scorpion EXO-1000 (review) and a Shoei RF-1100 (review). It worked better on the Scorpion in reducing noise. From “K.B.” (2/10): “I bought the NOJ Quiet Rider “Basic” model described by K.K. and fit it in my Shoei RF1000. I think it did reduce the noise slightly, and I had the same experience, of having the dry eye reduced. I liked it. However I found that it picked up smells when I set my helmet down on tables in diners and motels, and didn’t let those smells go. The worst is that motel air freshener spray. That table in the motel must have had some perfume particles that settled on it, and I had to wash it twice to get the smell out. And it picked up cigarette smells, or the smell of sour dish clothes used to wipe tables in restaurants of dubious cleanliness. Yuck. I eventually stopped using it because I didn’t want to be constantly reminded of the grimy diner I ate breakfast in. I then gave it to a friend who said he didn’t mind smells as much. He reported that it worked very well to block noise from his HJC full face, but that he too had to wash it regular, because it held on to sweat. If you don’t mind smells, or if you are not in the habit of setting your helmet down right side up on tables, then it’s a pretty good product. I liked the overlapping Lycra design of the basic model because it didn’t have any Velcro to catch in my hair. And I did not find it too warm, even in high summer. From “K.K.”: “What they should call this product is NOJ Calm Rider or NOJ Warm Rider. They actually have four models, not just the two shown on your website. I’ve been using these things for probably at least 15 years and can’t stand to ride without them. The NOJ Basic is simply two pieces of criss-cross Lycra Spandex, and is cheap at around $22. The benefit (for me and other people I know that like them) is NO drafts to dry out my contacts, not a reduction in noise (that’s what ear plugs are for), although it does help with rumbling in my various Arai helmets. I use the Basic model almost all year, and then use the Deluxe model in the winter. From “M.S.”: “I recently purchased the NOJ cold weather model. I had their old neoprene helmet skirt which I had used for so long I was using gaffers tape to hold it on. They have apparently replaced it with this new model. It is a little more expensive than I had thought it would be but there is nothing else out there that I could find. I purchased mine from Iron Pony for $58.90 including shipping. I have an Arai Signet helmet. It wasn’t too difficult putting the skirt on according to the directions. I was a little puzzled with how to attach the back of the thing but figured it out. The unit works very well. Keeps all the cold air out. It just closes off your neck to any draft. And in combination with my Gerbing heated collar I’m good to go. The little zippered vent does not seem to do very much. The down side is that my helmet is now more difficult to put on because the rim of the helmet’s lining has been forced inward. Also, I found that to ease the helmet on I first place it on the top of my head then pull the tail of the skirt down so that it doesn’t try to go into the helmet with my head. The performance in my view outweighs the extra effort in donning the helmet. From “G.S.”: “Your review just goes to show that no matter how hard you/we try, some things work well for some and not others. I ‘discovered’ the NOJ Quiet Rider (deluxe) 4 years ago. I have used it on my last two Arai Quantum helmets and 4 different bikes in that time. 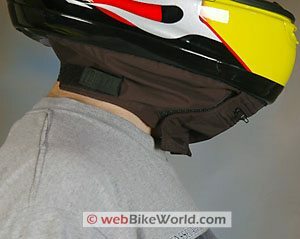 Personally, I find it significantly reduces the amount of wind noise and helmet lift. My motorcycles were either partially faired, or had no fairing at all. Plus, not only does it keep the cold air off my neck, it also keeps the blistering hot air off as well. I’ve sung the praises of this device to everybody I know. Some have come to like it as much as I do.